Has the spell been broken? Is The Magicians TV show cancelled or renewed for a fourth season on Syfy? The television vulture is watching all the latest cancellation and renewal news, so this page is the place to track the status of The Magicians, season four. Bookmark it, or subscribe for the latest updates. Remember, the television vulture is watching your shows. Are you? A supernatural Syfy drama, The Magicians stars Jason Ralph, Stella Maeve, Olivia Taylor Dudley, Hale Appleman, Arjun Gupta, Summer Bishil, Rick Worthy, and Jade Tailor. Brittany Curran and Trevor Einhorn join as season regulars in season three. Based on the Lev Grossman novels, the story follows Quentin Coldwater (Ralph) and his friends as they hone their magical abilities and fight off evil threats. In the second installment, they plotted to get rid of an evil deity, but in doing so eliminated magic. Now begins their quest to restore it. The third season of The Magicians averaged a 0.27 rating in the 18-49 demographic and 710,000 viewers. Compared to season two, that’s down by 14% and 10%, respectively. 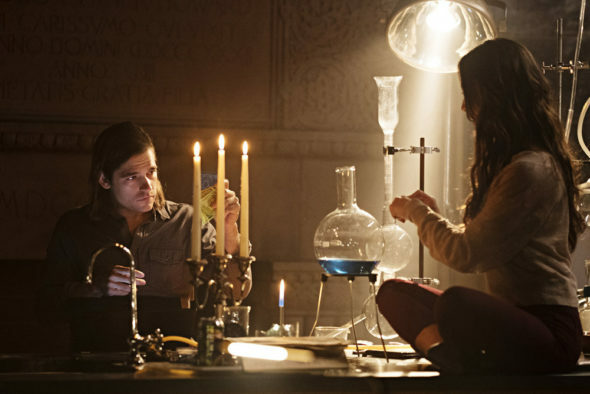 Find out how The Magicians stacks up against the other Syfy TV shows. On February 28, 2018, The Magicians was renewed for a fourth season which will debut January 23, 2019. Stay tuned for further updates. Will Syfy cancel or renew The Magicians for season four? The ratings have dropped a bit but it’s still one of Syfy’s top shows so, I think it will conjure up a fourth season. Since I don’t have a scrying mirror, I will keep an eye on the Nielsens and update this page with breaking developments. Subscribe for free alerts on The Magicians cancellation or renewal news. 2/28/18 update: The Magicians is renewed for season four on Syfy. Details here. TV show ratings are still important. Follow The Magicians‘ weekly ups and downs. Find more of The Magicians TV series news or other Syfy TV show news. What do you think? Are you glad that The Magicians TV show has been renewed for season four? How would you feel if Syfy had cancelled this TV series, instead? This is one that needs to keep it comin’! My wife and I are Supernatural fanatics, and there are many parallels to it in The Magicians. Such a good show; let it run its course! renewed for a fifth season all ready and episode one for season four just aired. There is a place for Magicians viewer votes above, but why does it not appear at all, on the 2017-2018 Shows Ranking, on the main website page? Above, it shows that it currently has a 9.59 average. It should appear within the top 10 on the list. The 2017-18 list you’re referring to includes shows from the five broadcast networks. But, why have a place for us to vote, if it’s not going to appear on the list? So that people can rate cable show episodes. We also have other group lists in the works. I worked on the show on seasons two and three and can honestly say it has been the best experience of my long career. Cast and crew are extremely close and morale on set couldn’t be better. We are an extended family and I sincerely hope for a fourth season so I can enjoy the privilege of once again working with such wonderful people. The ratings should be high enough for it to be renewed. It was the only show on SYFY that the ratings in season 2 were better than season one. SYFY hasn’t had a show like that in YEARS! I’m glad you actually got to work on the show. It must be a very interesting experience. They renewed Wynonna Earp for a third season, and that is a ratings DISASTER. I’m sure The Magicians will finish at least with twice the ratings of Earp, if not more. I would be shocked if it didn’t come back. The Magicians is one of the shows I look forward to coming back. They are very good story lines and great cast. Love this show! Originally found it by accident, binge watched all episodes to the present.